"Saint Luke" redirects here. For other uses, see Saint Luke (disambiguation). 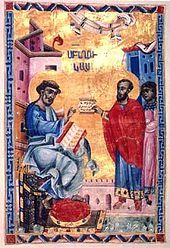 Luke the Evangelist (Latin: Lūcās, Ancient Greek: Λουκᾶς, Loukâs, Hebrew: לוקאס‎, Lūqās, Aramaic: לוקא‎, Lūqā') is one of the Four Evangelists—the four traditionally ascribed authors of the canonical Gospels. The Early Church Fathers ascribed to him authorship of both the Gospel of Luke and the Acts of the Apostles, which would mean Luke contributed over a quarter of the text of the New Testament, more than any other author. Prominent figures in early Christianity such as Jerome and Eusebius later reaffirmed his authorship, although a lack of conclusive evidence as to the identity of the author of the works has led to discussion in scholarly circles, both secular and religious. The New Testament mentions Luke briefly a few times, and the Pauline Epistle to the Colossians refers to him as a physician (from Greek for 'one who heals'); thus he is thought to have been both a physician and a disciple of Paul. Since the early years of the faith, Christians have regarded him as a saint. He is believed to have been a martyr, reportedly having been hanged from an olive tree, though some believe otherwise. The Roman Catholic Church and other major denominations venerate him as Saint Luke the Evangelist and as a patron saint of artists, physicians, bachelors, surgeons, students and butchers; his feast day takes place on 18 October. Many scholars believe that Luke was a Greek physician who lived in the Greek city of Antioch, Turkey in Ancient Syria, although some other scholars and theologians think Luke was a Hellenic Jew. Bart Koet, a researcher and professor of theology, has stated that it was widely accepted that the theology of Luke–Acts points to a gentile Christian writing for a gentile audience, although he concludes that it is more plausible that Luke–Acts is directed to a community made up of both Jewish and gentile Christians because there is stress on the scriptural roots of the gentile mission (see the use of Isaiah 49:6 in Luke–Acts). Gregory Sterling, Dean of the Yale Divinity School, claims that he was either a Hellenistic Jew or a god-fearer. If one accepts that Luke was indeed the author of the Gospel bearing his name and also the Acts of the Apostles, certain details of his personal life can be reasonably assumed. While he does exclude himself from those who were eyewitnesses to Jesus' ministry, he repeatedly uses the word "we" in describing the Pauline missions in Acts of the Apostles, indicating that he was personally there at those times. There is similar evidence that Luke resided in Troas, the province which included the ruins of ancient Troy, in that he writes in Acts in the third person about Paul and his travels until they get to Troas, where he switches to the first person plural. The "we" section of Acts continues until the group leaves Philippi, when his writing goes back to the third person. This change happens again when the group returns to Philippi. There are three "we sections" in Acts, all following this rule. Luke never stated, however, that he lived in Troas, and this is the only evidence that he did. The composition of the writings, as well as the range of vocabulary used, indicate that the author was an educated man. A quote in the Epistle to the Colossians differentiates between Luke and other colleagues "of the circumcision." 10 My fellow prisoner Aristarchus sends you his greetings, as does Mark, the cousin of Barnabas. 11 Jesus, who is called Justus, also sends greetings. These are the only Jews among my co-workers for the kingdom of God, and they have proved a comfort to me. ... 14 Our dear friend Luke, the doctor, and Demas send greetings. Colossians 4:10–11, 14. This comment has traditionally caused commentators to conclude that Luke was a gentile. If this were true, it would make Luke the only writer of the New Testament who can clearly be identified as not being Jewish. However, that is not the only possibility. Although Luke is considered likely to have been a gentile Christian, some scholars believe him to have been a Hellenized Jew. The phrase could just as easily be used to differentiate between those Christians who strictly observed the rituals of Judaism and those who did not. Luke's presence in Rome with the Apostle Paul near the end of Paul's life was attested by 2 Timothy 4:11: "Only Luke is with me". In the last chapter of the Book of Acts, widely attributed to Luke, there are several accounts in the first person also affirming Luke's presence in Rome, including Acts 28:16: "And when we came to Rome..." According to some accounts,[which?] Luke also contributed to the authorship of the Epistle to the Hebrews. Luke died at age 84 in Boeotia, according to a "fairly early and widespread tradition". According to Nikephoros Kallistos Xanthopoulos, Greek historian of the 14th century (and others), Luke's tomb was located in Thebes, whence his relics were transferred to Constantinople in the year 357. The Gospel of Luke does not name its author. The Gospel was not written and does not claim to be written by direct witnesses to the reported events, unlike Acts beginning in the sixteenth chapter. One analysis of the Gospel has suggested the possibility that the author of "Luke" may have been a woman. 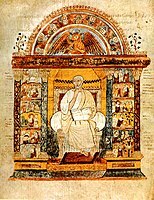 The earliest manuscript of the Gospel, dated circa AD 200, ascribes the work to Luke; as did Irenaeus, writing circa AD 180, and the Muratorian fragment from AD 170. The gospel of Luke and the Acts of the Apostles make up a two-volume work which scholars call Luke–Acts. Together they account for 27.5% of the New Testament, the largest contribution by a single author. Most scholars understand Luke's works (Luke–Acts) in the tradition of Greek historiography. The preface of The Gospel of Luke drawing on historical investigation identified the work to the readers as belonging to the genre of history. There is disagreement about how best to treat Luke's writings, with some historians[who?] regarding Luke as highly accurate, and others[who?] taking a more critical approach. Based on his accurate description of towns, cities and islands, as well as correctly naming various official titles, archaeologist Sir William Ramsay wrote that "Luke is a historian of the first rank; not merely are his statements of fact trustworthy... [he] should be placed along with the very greatest of historians." Professor of Classics at Auckland University, E.M. Blaiklock, wrote: "For accuracy of detail, and for evocation of atmosphere, Luke stands, in fact, with Thucydides. The Acts of the Apostles is not shoddy product of pious imagining, but a trustworthy record... it was the spadework of archaeology which first revealed the truth." New Testament scholar Colin Hemer has made a number of advancements in understanding the historical nature and accuracy of Luke's writings. On the purpose of Acts, New Testament Scholar Luke Timothy Johnson has noted that "Luke's account is selected and shaped to suit his apologetic interests, not in defiance of but in conformity to ancient standards of historiography." Such a position is shared by most commentators such as Richard Heard who sees historical deficiencies as arising from "special objects in writing and to the limitations of his sources of information." During modern times, Luke's competence as a historian is questioned, depending upon one's a priori view of the supernatural. Since post-Enlightenment historians work with methodological naturalism, such historians would see a narrative that relates supernatural, fantastic things like angels, demons etc., as problematic as a historical source. Mark Powell claims that "it is doubtful whether the writing of history was ever Luke's intent. Luke wrote to proclaim, to persuade, and to interpret; he did not write to preserve records for posterity. An awareness of this, has been, for many, the final nail in Luke the historian's coffin." Robert M. Grant has noted that although Luke saw himself within the historical tradition, his work contains a number of statistical improbabilities, such as the sizable crowd addressed by Peter in Acts 4:4. He has also noted chronological difficulties whereby Luke "has Gamaliel refer to Theudas and Judas in the wrong order, and Theudas actually rebelled about a decade after Gamaliel spoke (5:36–7)". Christian tradition, starting from the 8th century, states that he was the first icon painter. He is said to have painted pictures of the Virgin Mary and Child, in particular the Hodegetria image in Constantinople (now lost). Starting from the 11th century, a number of painted images were venerated as his autograph works, including the Black Madonna of Częstochowa and Our Lady of Vladimir. He was also said to have painted Saints Peter and Paul, and to have illustrated a gospel book with a full cycle of miniatures. Late medieval Guilds of Saint Luke in the cities of Late Medieval Europe, especially Flanders, or the "Accademia di San Luca" (Academy of Saint Luke) in Rome—imitated in many other European cities during the 16th century—gathered together and protected painters. The tradition that Luke painted icons of Mary and Jesus has been common, particularly in Eastern Orthodoxy. The tradition also has support from the Saint Thomas Christians of India who claim to still have one of the Theotokos icons that Saint Luke painted and which St. Thomas brought to India. In traditional depictions, such as paintings, evangelist portraits, and church mosaics, Saint Luke is often accompanied by an ox or bull, usually having wings. Sometimes only the symbol is shown, especially when in a combination of those of all Four Evangelists. Despot George of Serbia purportedly bought the relics from the Ottoman sultan Murad II for 30,000 gold coins. After the Ottoman conquest of Bosnia, the kingdom's last queen, George's granddaughter Mary, who had brought the relics with her from Serbia as her dowry, sold them to the Venetian Republic. In 1992, the then Greek Orthodox Metropolitan Ieronymos of Thebes and Levathia (the current Archbishop of Athens and All Greece) requested from Bishop Antonio Mattiazzo of Padua the return of "a significant fragment of the relics of St. Luke to be placed on the site where the holy tomb of the Evangelist is located and venerated today". This prompted a scientific investigation of the relics in Padua, and by numerous lines of empirical evidence (archeological analyses of the Tomb in Thebes and the Reliquary of Padua, anatomical analyses of the remains, carbon-14 dating, comparison with the purported skull of the Evangelist located in Prague) confirmed that these were the remains of an individual of Syrian descent who died between 416 BC and AD 72. The Bishop of Padua then delivered to Metropolitan Ieronymos the rib of Saint Luke that was closest to his heart to be kept at his tomb in Thebes. A rib, at his tomb in Thebes. ^ "Saint Luke the Evangelist". 27 December 2008. ^ Aherne, C. (1910). "Gospel of Saint Luke". Catholic Encyclopedia. New Advent. Retrieved 14 January 2019. it is controverted whether he actually died a martyr's death. ^ "St. Luke The Evangelist". Catholic News Agency. Retrieved 16 October 2018. ^ a b Harris, Stephen L. (1985). "The Gospels". Understanding the Bible: A Reader's Introduction (2nd ed.). Palo Alto: Mayfield. pp. 266–68. ISBN 0-87484-696-X. ^ a b c Strelan, Rick (May 2013). "Luke among the Scholars". Luke the Priest: The Authority of the Author of the Third Gospel. Ashgate Publishing. pp. 102–10. ISBN 978-1-4094-7788-4 – via Google Books. ^ a b Encyclopædia Britannica, Micropædia vol. 7, pp. 554–55. Chicago: Encyclopædia Britannica, Inc, 1998. ISBN 0-85229-633-9. ^ Thomas S. McCall, Th.D. Was Luke a Gentile? 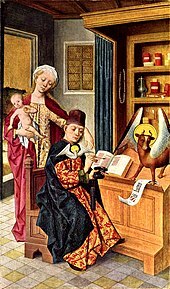 ^ "Catholic Encyclopedia: Epistle to the Hebrews". www.newadvent.org. Retrieved 10 January 2017. ^ Walsh, Michael, ed. (5 July 1991). Butler's Lives of the Saints. New York: HarperColllins Publishers. p. 342. ISBN 978-0-06-069299-5. ^ 'Ecclesiasticae Historiae Nicephori Callisti', Lib. II, Cap. XLIII, in J.P. Migne (ed. ), Patrologia Graeca Vol. 145 (Paris 1901), pp./cols. 875-878 (Internet Archive). (In Greek and Latin parallel). ^ E. P. Sanders, The Historical Figure of Jesus, (Penguin, 1995) pp. 63–64. ^ Donald Senior, Paul J. Achtemeier, Robert J. Karris (2002:328) Invitation to the Gospels Paulist Press. ^ Keith Fullerton Nickle (2001:43) The Synoptic Gospels: an introduction Westminster John Knox Press. ^ Bart D. Ehrman (2005:235) Lost Christianities: the battles for scripture and the faiths we never knew Oxford University Press, New York. ^ Bart D. Ehrman (2004:110) Truth and Fiction in The Da Vinci Code: A Historian Reveals What We Really Know about Jesus, Mary Magdalene, and Constantine. Oxford University Press. ^ Bart D. Ehrman (2006:143) The lost Gospel of Judas Iscariot: a new look at betrayer and betrayed. Oxford University Press. ^ Helms, Randel McCraw (1997). Who wrote the Gospels?. Altadena, CA: Millenium Press. p. 64. ISBN 0-9655047-2-7. ^ Brown, Raymond E. An Introduction to the New Testament, p. 267. Anchor Bible; 1st edition (13 October 1997). ISBN 978-0-385-24767-2. ^ Boring 2012, p. 556. ^ a b Grant, Robert M. (1963). "Chapter 10: The Gospel of Luke and the Book of Acts". A Historical Introduction to the New Testament. Harper & Row. Archived from the original on 21 June 2010. ^ Richard Bauckham, Jesus and the Eyewitnesses. 117. ^ Blaiklock, The Archaeology of the New Testament, p. 96, Zondervan Publishing Houst, Grand Rapids, Michigan, 1970. ^ Hemer, "The Book of Acts in the Setting of Hellenic History", 104–07, as summarized by MacDowell. ^ Johnson, Luke Timothy (1992). The Acts of the Apostles. The Liturgical Press. pp. 474–76. ^ Heard, Richard (1950). "13: The Acts of the Apostles". An Introduction to the New Testament. Harper & Brothers. Archived from the original on 20 June 2010. Retrieved 23 November 2009. ^ a b Powell, Mark (1989). What are they saying about Luke?. Paulist Press. p. 6. ISBN 0-8091-3111-0. Bradley, Francis Herbert, 1874, "The Presuppositions of Critical History," in Collected Essays, vol. 1, Oxford, Clarendon Press, 1935. McGrew's conclusion: historians work with methodological naturalism, which precludes them from establishing miracles as objective historical facts (Flew 1966: 146; cf. Bradley 1874/1935; Ehrman 2003: 229). ^ Ehrman, Bart; Craig, William Lane (28 March 2006). "William Lane Craig and Bart Ehrman "Is There Historical Evidence for the Resurrection of Jesus?"". College of the Holy Cross, Worcester, Massachusetts: bringyou.to. Retrieved 11 August 2010. Historians can only establish what probably happened in the past, and by definition a miracle is the least probable occurrence. And so, by the very nature of the canons of historical research, we can't claim historically that a miracle probably happened. By definition, it probably didn't. And history can only establish what probably did. ^ Grigg, Robert (1987). "Byzantine Credulity as an Impediment to Antiquarianism". Gesta. 26 (1): 3–9. doi:10.2307/767073. JSTOR 767073. ^ The basic study on the legends concerning Saint Luke as a painter is Michele Bacci, Il pennello dell'Evangelista. Storia delle immagini sacre attribuite a san Luca (Pisa: Gisem, 1998). ^ Father H. Hosten in his book Antiquities notes the following "The picture at the mount is one of the oldest, and, therefore, one of the most venerable Christian paintings to be had in India. Other traditions hold that St. Luke painted two icons which currently are in Greece: the "Theotokos Mega Spileotissa" (Our Lady of the Great Cave, where supposedly Saint Luke lived for a period of time in asceticism) and the "Panagia Soumela", and "Panagia Kykkou" which are in Cyprus." ^ Zuffi, Stefano (2003). "The Evangelists and their symbols". Gospel Figures in Art. Getty Publications. ISBN 0-89236-727-X. ^ George Ashdown Audsley; William Audsley (1865). "Chapter VI. Symbols and emblems of the Evangelists and the Apostles". Handbook of Christian Symbolism. Reprinted by Kessinger Publishing, 2003, ISBN 978-0-7661-5437-7. ^ Van Antwerp Fine, John (1975). The Bosnian Church: A New Interpretation: A Study of the Bosnian Church and Its Place in State and Society from the 13th to the 15th Centuries. East European Quarterly. p. 331. ^ Craig, Olga (21 October 2001). "DNA test pinpoints St Luke the apostle's remains to Padua". The Telegraph. ^ Tornielli, Andrea. 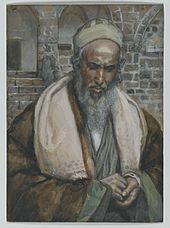 "The Beloved Physician". Archived from the original on 7 June 2009. ^ Wade, Nicholas (16 October 2001). "Body of St. Luke Gains Credibility". The New York Times. Michele Bacci, Il pennello dell'Evangelista. Storia delle immagini sacre attribuite a san Luca, Pisa: Gisem-Ets, 1998. I. Howard Marshall. Luke: Historian and Theologian. Downers Grove, Illinois: InterVarsity Press. F. F. Bruce, The Speeches in the Acts of the Apostles. London: The Tyndale Press, 1942. Helmut Koester. Ancient Christian Gospels. Harrisburg, Pennsylvania: Trinity Press International, 1999. Burton L. Mack. Who Wrote the New Testament? : The Making of the Christian Myth. San Francisco, California: HarperCollins, 1996. 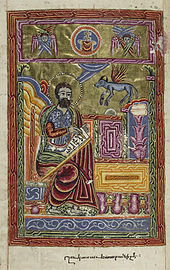 Wikimedia Commons has media related to Luke the Evangelist. Wikisource has the text of an 1879 American Cyclopædia article about Luke the Evangelist.